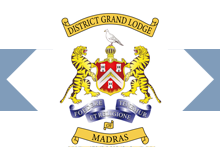 The Archibald Campbell Lodge had a meeting of the Lodge to felicitate R.W.Bro.K.R.N.Menon M.A ( Oxon ) Past District Grand Master of District Grand Lodge of Madras and member of the Lodge, on 25th July 2018, and the meeting was attended by our RWDGM R.W.Bro.T.A.Devagnanam, and other visiting brethren. During the meeting the Secretary of the Lodge Bro.Brij Mohan Sehgal read the Masonic Bio data of R.W.Bro.K.R.N.Menon and at the request of Worshipful Master of the Lodge, our RWDGM, asked W.Bro.Sukesh Menon PAGDC, Past DGDOC, to read the citation and after this, RWDGM presented the citation and 50 year lapel pin to R.W.Bro.K.R.N.Menon. W.Bro.Sukesh Menon spoke about the book written by R.W.Bro.K.R.N.Menon on Masonic education and procedures, he described him as an icon and shall remain always because in case of any difficulties or clarifications, R.W.Bro.K.R.N.Menon has been to our rescue. W.Bro.Sukesh wished and expected that R.W.Bro.K.R.N.Menon shall always be, as has been, continue to lead from front. RWDGM illustrated hidden aspects of R.W.Bro.K.R.N.Menon’s life and his Masonic achievements. RWDGM said in case any need relating to Masonry, he has been only and only depended on him and look forward to have his able leadership always. He appreciated his completion of remarkable projects during his tenure as DGM and later. RWDGM acclaimed with appreciation his contribution in making a Library / Contribution to charity and educating young entrant in freemasonry. While wishing R.W.Bro.K.R.N.Menon, RWDGM reasserted the former as an icon and wished him to keep good health and Masonic sprits. R.W.Bro.K.R.N.Menon while thanking and wishing all present, expressed his pleasant surprise that he never thought to reach 50 years in Freemasonry at the time of joining the Lodge. R.W.Bro.K.R.N.Menon narrated the situation in the Lodge when there was separate dining for orthodox and non drinkers and also rule in place for non residents and residents joining the Lodge, which with his efforts were done away with. He remembered in older days in absence of in house dining facility, it was Hotel Connemara where dinner was taken. He stressed on the strict discipline and team work to achieve positive results. For example bringing the financial balance sheet of DGL 2001 from red to Rs.30 crores plus and grand success of Centenary celebrations done in last August 2017, The Library etc, only team work could accomplish these. He called upon all the Freemason fraternity to contribute to Charity with a smile and whole heartedly. There is universal need for charity and it must be kept in mind of all of us to donate regularly to meet the challenges at home & internationally. He advised the all present to take full use of library to enrich one self with knowledge to live straight forward life coupled with principles of Freemasonry. R.W.Bro.K.R.N.Menon thanked the two speakers W.Bro.Chitale and W.Bro.Sukesh Menon, who spoke for him, and thanked R.W.Bro.T.A.Devagnanam, DGM for sparing his valuable time for the felicitation and speaking about his Masonry life and assured his availability for the cause of charity and Freemasonry always. The brethren of P.U. 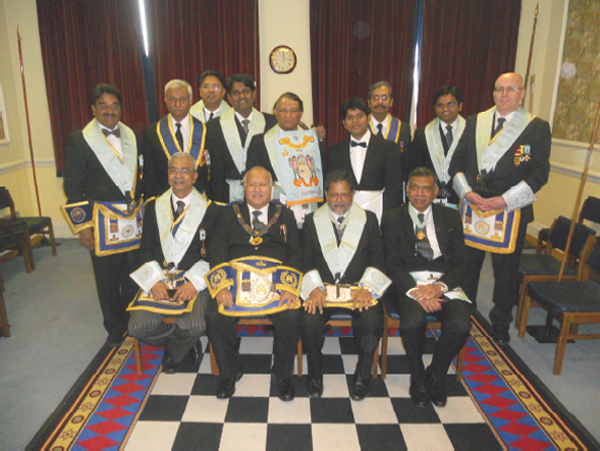 No.150 had their meeting on 10th June 2013 (Mon) – 10.30 a.m. at Mark Masons Hall. 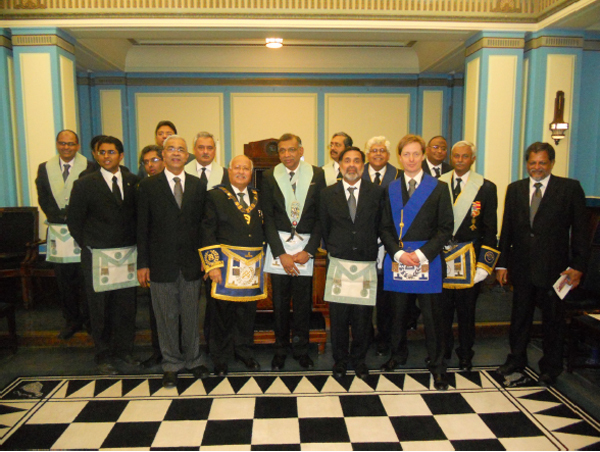 Once an year they have their meeting in London, coordinated by W.Bro. Chellappa. The W.M. P.B. Shankar & brethren conducted a II degree ceremony in a fitting manner followed by lunch. Brethren from Archibald Campbell lodge also participated and assisted in the working. The brethren of Archibald Campbell Lodge No.4998 had their meeting on 10th June 2013 (Mon) – 5.00 p.m. attended by 13 brethren at Room No.15, UGL Building at Queens Street. A III degree ceremony was done by the W.M. 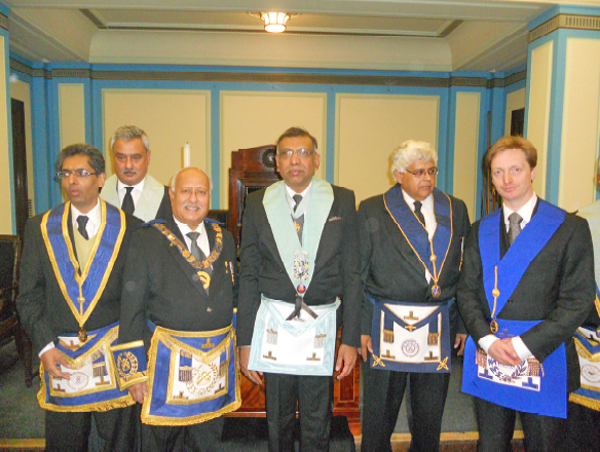 Kartik Sabanayagan ably assisted by the brethren in an impressive manner. Bro. James Campbell from Cambridge also a member, coordinated the meet along with Mathew Joseph. 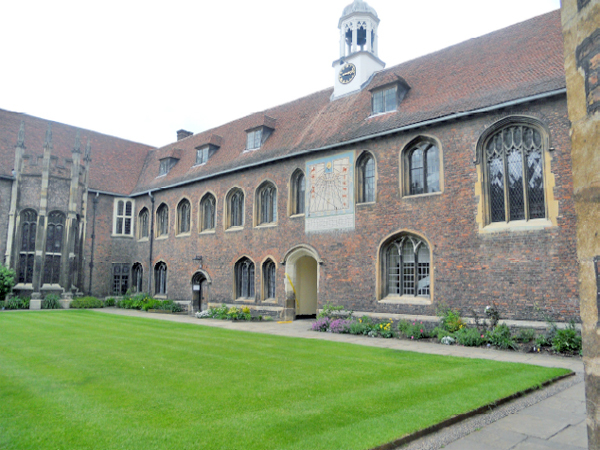 On 11th June (Tue) – 5.00 p.m. the Isaac Newton University Lodge No.859 met and 12 brethren of Archibald & me attended at Cambridge. 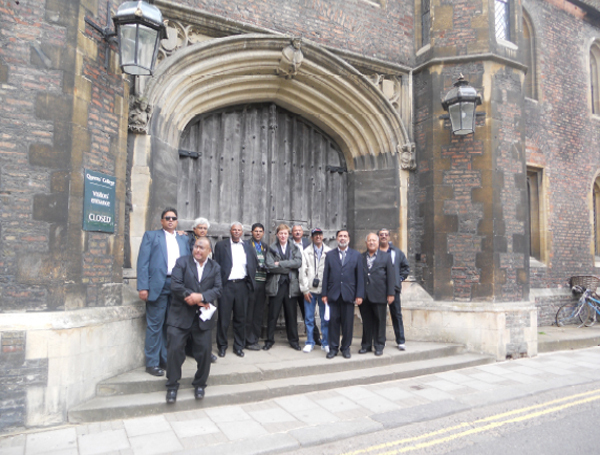 It is the Lodge of Cambridge University and membership is only open to members of the University. It was founded in 1861. The current master is W.Bro. Dr Justin Bishop. Bro. James Campbell was W.M. three years ago. 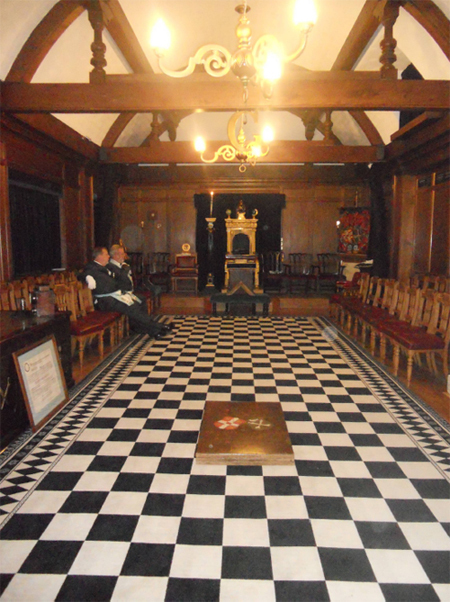 The real reason for visiting however is that Sir Archibald Campbell was initiated, passed and raised in the Isaac Newton University Lodge before he left for India. It was thus his mother lodge. He never held office, however. He went through the master's chair in India. 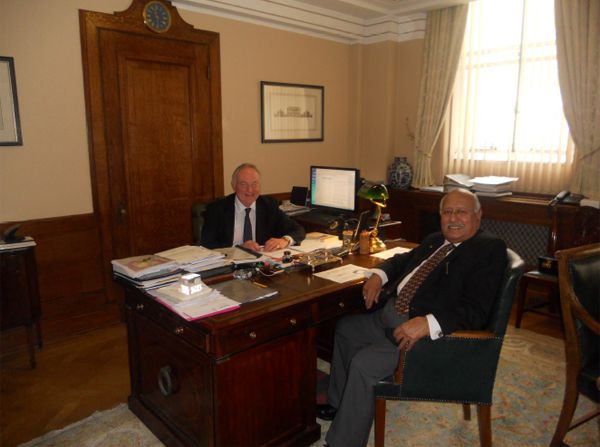 Apart from this I met the Grand Secretary V.W.Bro. Nigel Brown and also attended the Emulation Lodge of Improvement on 14th June where an Installation ceremony was done in an impressive manner. As Dy.DGM I had the privilege of attending all these meetings with about 22 brethren from these lodges. Photos of some events are forwarded at the end. Date of Warrant: February 1, 1928. Meets: Last Wednesday of January, February, March, April, July, August, September, October and November. No meeting in May, June and December. Election: September. Installation: October.